The following is a quick description of the wool being dyed for a multi-level custom bedroom rug. For this project I start with black powder dye and add brown powder dye, water is added to make what I call the elixir. The ratio is 1 tablespoon of powdered dye to one half cup of water. There should be enough elixir to dye all the wool necessary for the completion of the rug. Running short of the original mix is not a good idea because it is very difficult to reproduce that exact color. This geometric rug measures 15 ft x 16ft with a hallway and closet included. The amount of wool used for our hooking technique is 8 ounces per square foot, this of course varies, especially using the thinner one ply wool. 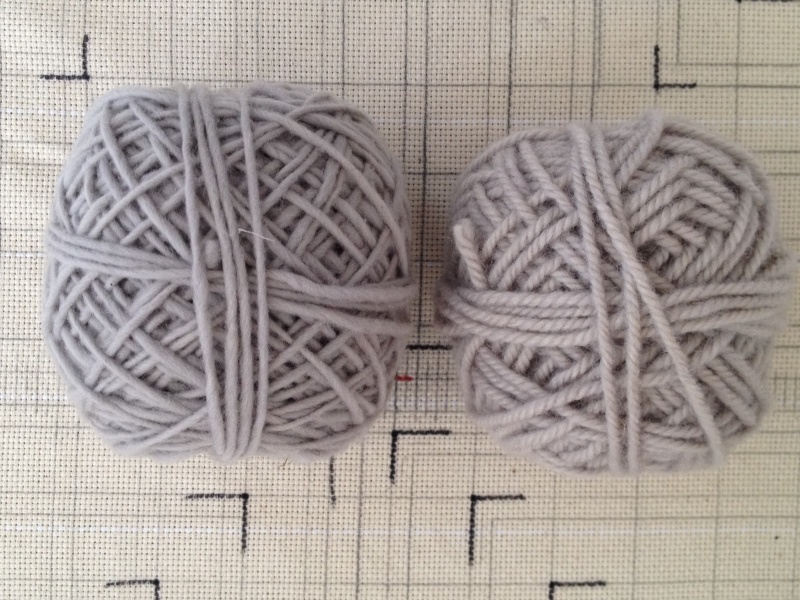 The wool sample on the right is our typical three ply rug hooking wool. This wool needs a separate dye formula from the single ply, as the wool absorbs the dye differently. The wool on the left is a signal ply that is dyed in 1 pound skeins. This wool absorbs the dye differently from the typical 3 ply wool hooking wool we use (pictured on the right). The dye mixture has to vary to accommodate that particular wool. The finished rug in this case wants to be a monotone gray on gray color, with the single ply hooked higher then sheared and the three ply wool hooked lower for a multi level and textured design. All that being said there is a lot of mixing and sample dying to get the perfect shades of color needed for a monotone rug. The next post will show the finished rug installed in a NYC Bedroom.